Most Popular There are 107 products. Paracord Grab Bag includes One (1) or more, depending on quantity ordered, 100 ft. hank or hanks of 7 strand 550 defective Paracord. Lightning 550 Paracord is black, electric blue, white and baby blue (Nylon/Nylon). Made in USA. Iraqi Vet 550 paracord is light grey with white, red and green X's (Nylon/Nylon). Made in USA. Spool Ends - REFLECTIVE - 200 ft Plus (Can contain 550, Micro, type 1 , 275, 425, or 650 Coreless Paracord with either reflective tracers or glow tracers or both). Counts as 1 item towards 50 free buckles and flat rate shipping. 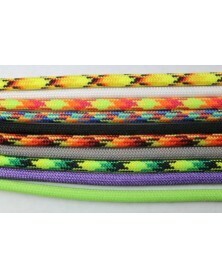 Barney and Company 550 Paracord is bright pink, purple, white and black (Nylon/Nylon). Made in USA. Spool ends are a variety of lengths and colors and may include a variety of types of paracord - Micro, Type One, 275 tactical, 425 tactical, 550 paracord, and/or 650 coreless paracord. Subject to what we have on hand. Counts as 1 item towards 50 free buckles and flat rate shipping.